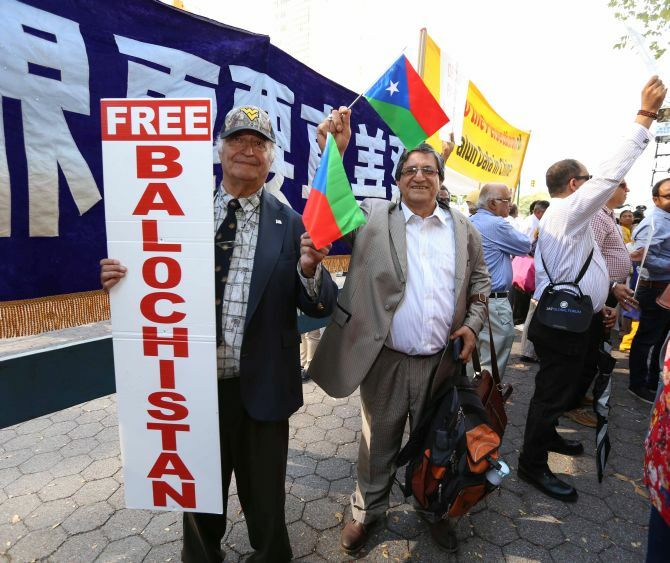 Several Baloch and Indian activists held large-scale demonstrations outside the United Nations headquarters in New York while Pakistan Prime Minister Nawaz Sharif addressed the UN General Assembly as they were joined by other groups demanding that it stop “exporting” terror into India. The protesters converged across the street from the world body’s headquarters to condemn atrocities and human rights violations by Pakistan just as Sharif was addressing the General Debate of the General Assembly. 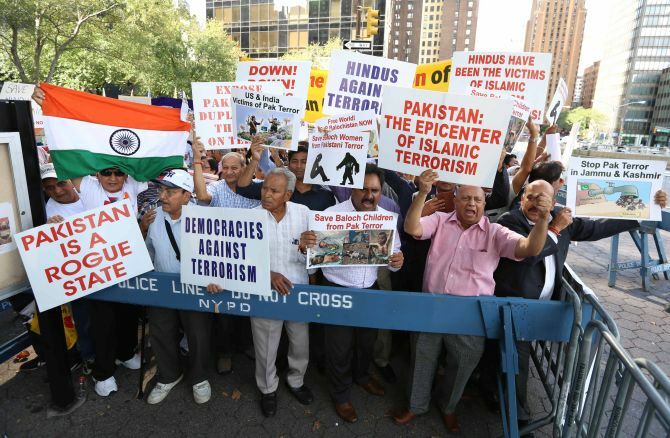 The crowd shouted slogans of ‘Free Balochistan’, ‘Down Down Pakistan’, ‘Save World from Pakistan Terror’ as they waved banners and placards that read ‘US Government stop giving funds to Pakistan’, ‘Kashmiri Hindus are Humans, Wake up to their sufferings’, ‘Remove Pakistan from the UN’, ‘Stop Atrocities in Pakistan-occupied Kashmir’ and ‘Killing Fields of Pakistan - Sindh and Balochistan’. “Pakistan is a terror state and does not want the people of Balochistan to live in peace,” Ahmar Musti Khan, founder of the American Friends of Balochistan said. He said Pakistan and its leaders are committing crimes against the residents of Kashmir, demanding that the country stop “exporting terror and let its neighbours live in peace”. He added the Pakistani leadership should respect the right to self determination of the Baloch people. Khan said the Baloch people are “indebted” to Prime Minister Narendra Modi “for speaking out for Balochistan’s right and the right of the Baloch people to be the masters of our own destiny”. He slammed the Pakistani army for its brutalities against “innocent Balochis”, saying “the Pakistan army is Islamic State in uniform”. The Baloch National Movement condemned the Pakistani atrocities and the ‘ongoing military operations’ in Sindh and Balochistan. “Baloch and Sindhi people appeal to the freedom loving citizens of America and the world to support our demands for freedom, peace, and justice. We, the victims of Pakistani state aggression and crimes against humanity, want to tell the world that ‘Pakistan is a nuclear-armed terrorist state’ and must be stopped,” the group said. Condemning the “barbaric” terror attack on the Uri camp in Kashmir and Pathankot air base, BNM said such attacks are part of Pakistan’s policy of “aggression, employing terrorist methods and outfits to escalate war in the region”. It said the Baloch people are grateful for the support extended by the Indian prime minister at “such a critical juncture when our nation is struggling to be free from the illegal military occupation of Pakistan since 1948”. Jayesh Patel, the former President of the Overseas Friends of Bharatiya Janata Party, said Pakistan should stop terrorism against India, saying countless innocent lives have been lost due to attacks in Kashmir, mostly recently on the army base in Uri that killed 18 jawans. “The families of our soldiers are the worst sufferers,” he said. The BNP on Wednesday said since 2003, more than 20,000 Baloch political activists have gone missing, illegally abducted by the Pakistani state security forces. “The victims of enforced disappearances are being tortured and executed in custody in thousands,” it alleged.